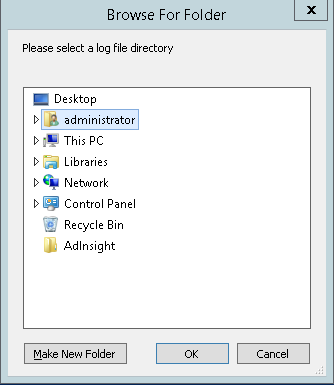 The script then logs information to a log file that you specified and that location is printed to the screen. 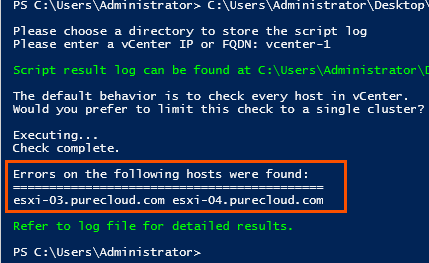 Both scripts will attempted to install PowerCLI through the PowerShell gallery if it is not installed, and if it is, it will make sure it is loaded. Make sure you are at least running PowerCLI 6.3 or later. The script will terminate if it is not at that release. Disk.DiskMaxIO size. This is optional and only needs to be changed if you are using vSphere Replication or UEFI boot for your VMs. The script asks you this at the start. If you are intending to use these options, say yes so it will change Disk.DiskMaxIOSize to 4 MB from 32 MB. If there are any FlashArray devices that do not have RR and IOPS=1 set, it will set them too. It will look for any FlashArray VMFS-6 volumes and ensure automatic UNMAP is enabled. If it isn’t it enables it. The “check” script checks ONLY for issues and does not change anything. It also checks for more things. It will generally only log problems, if something looks fine it will not be fully logged. Disk.DiskMaxIO size. This is optional and only needs to be changed if you are using vSphere Replication or UEFI boot for your VMs. so if you get a warning about this not being set and you are not using those features, you can ignore this. If there are any FlashArray devices that do not have RR and IOPS=1 set, it will log them too. Only devices on that host with one or more issues will appear. The problematic setting will be marked with an asterisk. 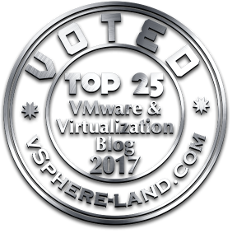 If the setting is irrelevant (a device isnt VMFS-6, so automatic UNMAP doesnt exist, or it isnt being used as a VMFS) the value will be N/A. That is listed for anything that is not set properly. Thank you for your invaluable work on these scripts! P.S. : The Best Practices Checker link is broken(there is a typo in the ps1 file name). You’re very welcome! Ah oops, that should be fixed now. The UNMAP one is coming soon! Awesome blog posts and tools, thank you! One question/concern I have is with the checker script. It is my understanding that iSCSI port binding should not necessarily be used in all cases. For example, in the case of a network layout where there are multiple subnets in use for iSCSI (analogous to a ‘fabric-a’, ‘fabric-b’ in FCP world). VMware has a KB on this (2038869). Just wondering if you agree with this and if it’s worth adding an additional step(s) to you script or making at least making a special note in script about multi-subnet iSCSI configs? You’re welcome! Glad it is helpful to you. I will try to keep it up! This is a good point, I will add this to the post. Thank you! Great stuff and many thanks for putting this out there!!! Quick question about these: can I run the best practices script in a Live environment without any impact? The best practices checker finds a few issues that need cleaning up and I was reasonably sure that the best practices script is only non-impacting changes but wanted confirmation. With our 3 arrays and a massive VM host refresh coming up, it would be much quicker to use this script if you can confirm non-impacting. Apologies if I have missed where this was answered. Yep! All non-disruptive. Go for it. Is this still the latest version and do all setting still apply to VMware 6.5 U1? This should be set to 16386 (16 MB). I was wondering if you could expand on what isn’t needed for ESXi 6.5 U1. I’ll be setting up a new install in a week or two. None of this is needed if you are on 6.5 U1. Arguably EnableBlockDelete could be turned on because you would likely have some VMFS-5 datastores still, but it’s not totally required, I would focus more on moving to VMFS-6 than worrying about this setting. If I understand correctly, we don’t need this script if we’re on 6.5 U1 / VMFS6 ? So all pure best practices are default now in 6.5 U1? That’s awesome! Thanks for all the great info! Sorry, I am new to PowerCLI. 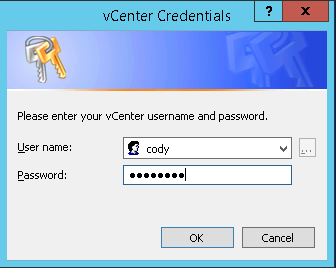 I was able to install the Powershell VMware.powerCLI module and can manually connect to vCenter using it but the script does not appear to be working for me. I am getting about 25 errors when it ran. I am using the most recent module from the Powershell Gallery. Nothing to apologize about! Could be a variety of things–could you show me an example of one of the errors? They are likely all related. Also–if you ever want quick support on these scripts, feel free to open a ticket with Pure Storage support–they are happy to help you even with a script. I will help as fast as I can, but they can probably help you faster. quotation marks ("&") to pass it as part of a string. + … 2018 GitHubGitHub’ in expression or statement. Ah I see what you did. Looks like you right-clicked on the link in github and saved as ps1. This link actually points to an HTML file, so PowerShell doesnt run. CLick on the link and then choose view raw. Save the raw text (the code) as a ps1 file. That should do it. That appears to fix the issue. Thank you for your time. Whats the best way to delete the user added SATP rule? [****NEEDS ATTENTION****]There is more than one rule. The last rule found will be the one in use. Ensure this is intentional. What about ATS Heartbeat on VMSF5? We regularly disable that because we’ve had occasional performance issues in the past. This best practices check scrip flags that because of VAAI ATS hardware locks. Is it a big deal to leave this disabled? Well it depends on your vendor on this. We (Pure) recommend having it enabled if possible–removing the use of SCSI locking is generally a performance enhancer, not the other way around. Do we absolutely require it? No. We only absolutely require ATS be enabled in general. So since you are using Pure, I would enable if possible, but we will still support you if you do not.